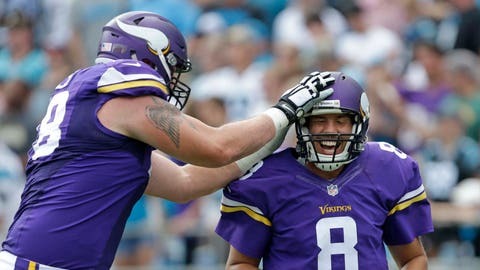 The Minnesota Vikings' Sam Bradford (right) is congratulated by Jeremiah Sirles after touchdown pass against the Carolina Panthers. That was evident with a glance at this past Sunday’s participation chart, which featured six linemen, two of whom had not played this season. Clemmings played every offensive snap in his first career start at left tackle, while Sirles played 35 snaps at left guard. Offensive linemen Joe Berger, Brandon Fusco and Andre Smith played 100 percent of the team’s offensive snaps for a third straight week. — Jerick McKinnon was Minnesota’s primary running back in place of the injured Adrian Peterson, playing on 65 percent (35) of the team’s offensive snaps. He finished with 16 carries for 45 yards. Matt Asiata played on 19 snaps (35 percent) and finished with six carries for 15 yards. Free-agent signee Ronnie Hillman was inactive. — Wide receiver Jarius Wright played his first (and only) offensive snap of the year. The fifth-year pro has caught seven touchdowns in his Vikings tenure but none since 2014. — Cornerback Xavier Rhodes played 57 of Minnesota’s defensive snaps (74 percent) in his first game of the season. Trae Waynes played a season-low 31 snaps, after playing nearly every play in the team’s first two games. The defense allowed Cam Newton to pass for 262 yards but intercepted him three times. — Andrew Sendejo is the only defensive player to have played every snap this season, after Harrison Smith, Anthony Barr and Eric Kendricks each sat out plays Sunday. — Rookie safety Jayron Kearse made his defensive debut, playing one snap. Marcus Sherels played four snaps at cornerback and nearly had an interception in his first action on defense this year, while linebacker Emmanuel Lamur played six snaps in his defensive debut.